TOP ‘A Brighter Future’ Fundraising Campaign Gives New School Uniforms To More Than 400 For Back-To-School Cheer! 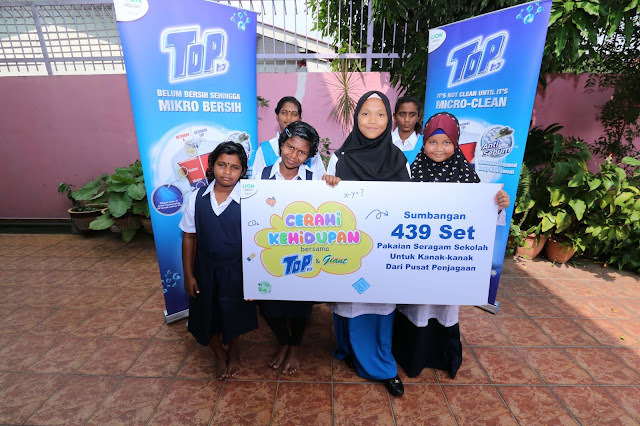 TOP, the No.1brand in Peninsular Malaysia in the Detergent category brought back-to-school cheer to more than 400 children from across the nation, through its ‘A Brighter Future with TOP’ campaign that successfully raised funds for new school uniforms, shoes and socks. TOP collaborated with leading retailer, Giant to carry out the charity fund raising campaign from November 13 to December 13, which saw 30 cents from the sales of selected TOP products from all Giant outlets nationwide channeled towards providing the back-to-school necessities for children aged between 7 to 17 years from 18 care organizations. The school necessities include a full school kit of brand new uniform, shoes and socks for each child. 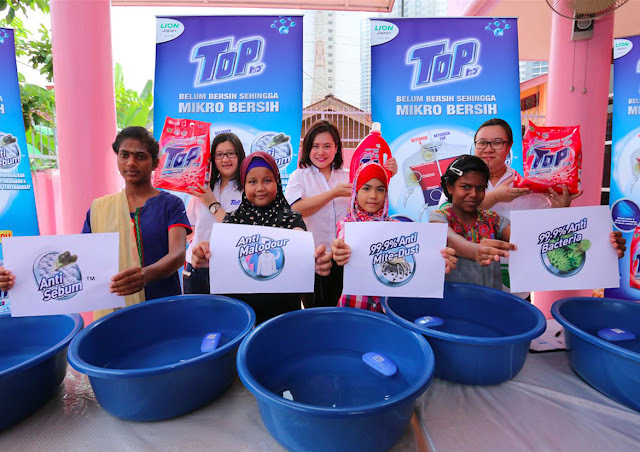 As part of the education component of the campaign, the Southern Lion team, held a laundry workshop for the children from Rumah Solehah and Rumah Kebajikan Karunai Illam at Rumah Solehah. The new school uniform kits were also presented to the children at this event. At the close of the event, the children tried on their new school kits, looking smart, and smiling broadly. Southern Lion Sdn Bhd General Manager, Ms Carmen Foo thanked Giant and its customers for their generous support of the program that has brought much hope and joy to more than 1,200 children from care organization across the nation since its inception over the past two years. “We are grateful for the support of Giant and their customers, who have given generously to support a cause that is close to our hearts, and that means a lot to children who have much less than what we take for granted. Their kind support has given hope and joy to children who can look forward to starting the school year with new uniforms, just like their other schoolmates. In return TOP is glad to provide the innovation and benefits of our products to all. We are proud to be part of an initiative that is motivating more children to enjoy a brighter future. Our thanks to all TOP users who have made this possible for the third consecutive year,” said Ms Foo. Rumah Solehah administrator, Cik Fathiiah, mentioned that TOP has stepped up to assist these children in a meaningful way making them happy. “We value the contribution for it has help us tremendously in caring for the children’s needs and educating our children on the responsibility of taking care of their school uniforms,” said Cik Fathiiah. “We really appreciate the school uniforms, shoes and socks given to us. It is nice to start a new school year with clean and stain free school uniforms. We also had a lot of fun participating and learning in the workshop. This will surely help me to take good care of my new school uniform and other clothing” said Yamini A/P Jagen resident of Rumah Kebajikan Karunai Illam. Last year, the brand introduced its TOP Micro-Clean Tech with Anti-Sebum innovation that has given users in tropical climates such as Malaysia a practical solution to the problem of ground-in sweat and sebum. TOP Micro-Clean Tech with Anti-Sebum innovation reaches deep into the fibre core to pull out trapped sebum and sweat effectively. TOP laundry solutions are available nationwide. Among the TOP liquid detergent variants are Stain Buster, Brilliant Clean, Blooming Pleasures, Odour Buster, Colour Protect for top-loading machines, with the Smart Clean variant for front-loading machines. The powder detergent variants include Super White, Super Colour, Super Hygienic and Blooming Freshness for top-loading machines, and Super Low Suds for front-loading machines. TOP Day Fresh softeners are formulated for both top-loading and front-loading machines, and come in variants that include Romantic Pink, Sensual Purple and Serene Blue. TOP Lite is for delicate clothes.